1) The applicant was charged by Czech courts in 2010 and found guilty in 2011 of committing the crime of unlawful production and other disposal of narcotic drugs or psychotropic substances or poisons in connection with the fact that he grew and processed cannabis with a Tetrahydrocannabinol (dronabinol, hereinafter "THC") content of over 0.3 % (see Annexes 2 and 4). The Supreme Court of the Czech Republic and Constitutional Court of the Czech Republic reaffirmed the judgments of the previous courts (see Annexes 6 and 8). 3) The applicant corroborated before Czech courts that he has been vainly applying to the Czech Ministry of Health since 2000 for the forms and permits to study medical use of cannabis, yet in the Czech Republic there is no form of regulation, no permit can be issued to grow cannabis and there is no methodology for treating patients with cannabis. Any growing or trafficking of cannabis with a THC content of over 0.3 % is forbidden in the Czech Republic and can be criminally prosecuted regardless of whether the cannabis is used for scientific research, medical treatment or educational ends, or for its narcotic effect and endangering public health and safety. 4) Since 2004 the applicant has successfully treated his own chronic ailments with cannabis, which was corroborated before the courts by physicians and testimony from the applicant's wife. 5) In 2008, supported by experts and patients, the applicant decided to register the professional association Konopí je lék, o.s. and started growing cannabis and providing it to the sick while also educating the lay and professional public at the research farm of medicinal cannabis genetics that he founded with his wife in the village of Ospělov near Olomouc. 6) Empirical findings from the research conducted unequivocally confirm the palliative and causal effect of cannabis, the safety and gentleness of the treatment through appropriate synergies and proper processing of the substances contained in cannabis on specific afflictions, and in some cases the results even surpass those achieved through conventional methods, or are in fact the only effective treatment. 7) As part of his "Konopí je lék" (Cannabis is medicine) research, the applicant sought out and studied strains of cannabis suitable for treatment and the best forms of processing and dosing for given illnesses, while also optimising treatment (standards, indications) and trying to rehabilitate the cannabis plant, which contains many curative substances, in view of the fact that among the hundreds or possibly thousands of strains of cannabis there are completely different synergies of cannabinoids and reactions (cannabis contains dozens of cannabinoids, with the effect of cannabinoids CBD and THC currently being the most thoroughly described). 8) It must be added that one of the most extensive receptor systems in mammals is the body's own cannabinoid system, which was discovered at the start of the 1990s, and Olomouc's Palacký University and its employees and graduates hold a number of world firsts in discovering medicinal substances in cannabis. In the nineties Spanish researchers first demonstrated the successful treatment of cancer (apoptosis). The applicant, along with physician Irina Hubernáková, are likely the first researchers in the world to have repeatedly demonstrated complete curing of "diabetic foot" slotted for amputation using cannabis salve (cannabis salve has no narcotic effects). 9) As a result of his activities the applicant is widely recognised by the Czech public, which shows that the applicant's case is not one of drug dealing. The facts stated were in no way called into doubt by Czech courts, but were found to be irrelevant from the perspective of Czech criminal law. 10) The courts were repeatedly sent evidence of successful treatment of a number of illnesses backed up by court expert assessments and physician statements accompanied by photographic documentation and the documentary films also publicly available on YouTube – Konopí je lék, Konopné pašije and Rok konopí, which in the opinion of the applicant shows that the official apathetic stance of the State or society results in fatal damages to the life and health of thousands of patients as well as to the State budget. For example, in the Slovak and Czech Republics there are at least three thousand amputations performed annually on diabetics who could be helped by cannabis salve. 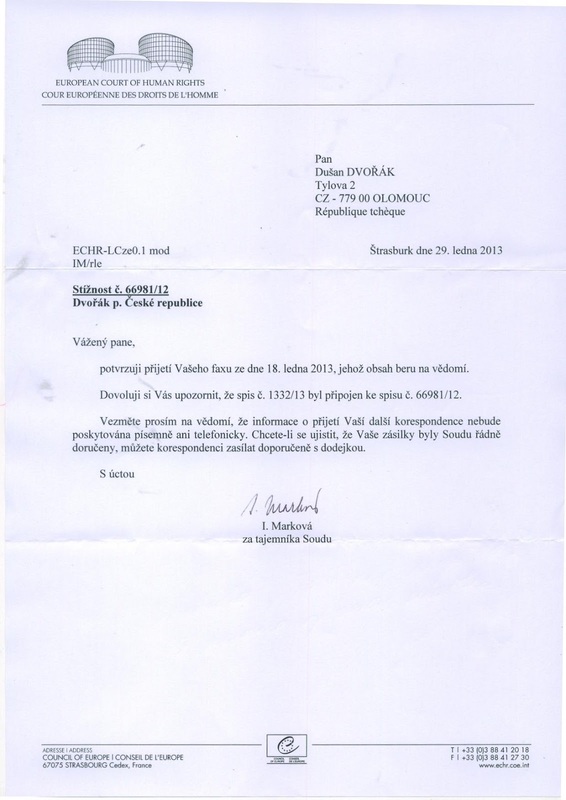 11) Since July 2012 the applicant has suffered a Class 3 disability and has invested significant financial means into the research of medicinal cannabis genetics, processing, therapy and education, which have been repeatedly damaged by intervention from the Police of the Czech Republic; the applicant's family has suffered significant damages. 12) The European Commission has accepted as admissible the applicant's complaint on violation of EU rights specified in part II of this application and since 22 February 2012 has been investigating it under file number CHAP (2012) 00282. 13) The applicant faces four charges up until 2012 for growing cannabis for his "Konopí je lék" research and cannabis is regularly confiscated at harvest time by the Czech Police at his research farm in Ospělov. After the applicant was not successful at higher court instances with his argumentation related to the violation of EU and human rights by the Czech Republic, the public prosecutor's office is currently paradoxically not pushing for further convictions, but rather proposing withdrawing the charges, alleging that the applicant was mentally unsound during the time he was growing the cannabis up until 2012. The applicant believes that in this way the Czech authorities hope to cover up their own unlawful actions. This unfounded labelling of the applicant as mentally unsound is a (further) wrongful interference with his human rights, though it cannot yet be the subject of a complaint as all court instances have not been exhausted. 14) The applicant accuses the Czech Republic of violation of Article 6 of the Convention for the Protection of Human Rights and Fundamental Freedoms (hereinafter the "Convention") which stipulates the right to a fair trial. The reason is that the Czech courts refused, on the basis of an irrational assessment and insufficient substantiation, in fact with regard to the applicant's specific argument none whatsoever, to request a preliminary ruling from the EU Court of Justice (hereinafter the "ECJ"), even though an interpretation of EU law was crucial for resolving the case and at least the Supreme Court of the Czech Republic was obliged to do so as the court of last instance within the meaning of Article 267 (3) of the Treaty on the Functioning of the European Union (hereinafter "TFEU"). 15) Considering the "approximation" of the legal systems of the Convention and EU law on the basis of the planned EU accession to the Convention, it is worth posing the question of whether the slightest effect will be attributed to EU law in light of the Convention or whether on the contrary national courts will be allowed to wilfully violate obligations arising from EU law from the perspective of the Convention. 16) Before national courts the applicant argued and corroborated in detail that the Czech Republic failed to uphold its obligations to notify according to Directive 98/34/EC in the case of the Czech Act on Addictive Substances (hereinafter the "Act on AS"), even though it was obliged to do so, in particular with amendment of the Act following the Czech Republic's accession to the EU. 17) In light of the ECJ case-law (since the judgment on case C-194/94 CIA, point 54), the fact that the obligation to notify was not observed would mean that several requirements of the Act on AS are unenforceable, in particular the obligation to hold a permit for the handling of addictive substances and the prohibition on growing cannabis with a THC content of over 0.3 % (see Annex 9). 19) This also means that the applicant could not be found de jure guilty of the criminal act, as he would be being sanctioned for the failure to observe regulations that could not be enforced against him due to failure to observe the notification procedure of Directive 98/34 (see ECJ judgment on the case C-20/05 Schwibbert, in particular points 14, 44 and 45, on criminal proceedings for counterfeiting CDs). 20) Czech courts however refused to do so on the basis of a single substantive legal argument, specifically that the Act takes advantage of the exemption from the obligation to notify as per the first bullet of Article 10 (1) of Directive 98/34/EC, because it is transposing EU regulations, specifically a Regulation (though not regulations related to addictive substances, but rather to their precursors). 21) EU law however prohibits Regulations from being transposed into national law as this would endanger the direct applicability of these standards as per Article 288 (2) of the TFEU (see the ECJ judgment on case 34/73 Variola). (see ECJ judgment on case 31/78 Bussone), the exemption under Article 10 (1) of Directive 98/34/EC applies a priori only to the transposition of Directives under Article 288 (3) of the TFEU which requires a Member State to transpose EU technical specifications. 23) Nevertheless, even the applicant cannot rule out that there is an EU Regulation that would require within the meaning of the Bussone case-law the adoption of a technical specification within the meaning of Article 10 (1) of Directive 98/34/EC. The Czech courts did not however refer to such a hypothetical possibility in any way and with their blanket statement they must allow that they committed the amateurish error of mixing up the general regime for EU Regulations (prohibiting transposition) with the general regime for EU Directives (requiring transposition). 24) The applicant's main criticism in terms of the Convention is that if the Czech courts were generally mixing up the regime for EU Regulations and the regime for EU Directives, then they were at least also obliged to positively back up their claims as the applicant repeatedly demanded, i.e. to specifically corroborate which alleged Regulation provisions directly causally required the adoption of the contentious requirements of the Act on AS. Only in such a case could the requirements of the Act on AS take advantage of the exemption from the obligation to notify on the basis of Article 10 (1) of Directive 98/34/EC as stipulated by the ECJ case-law (see C-289/94 stated in more detail below). 25) Although the applicant's objection was decisive for the resolution of the case, Czech courts did not corroborate in any way that the conviction of the applicant was a case of acte clair or éclairé according to the ECJ case-law on 283/81 CILFIT. 26) On the contrary, the applicant is of the opinion that all facts indicate that it is a case of acte éclairé in his favour, i.e. that the unenforceability of the requirements under the Act on AS is clearly existent, whereupon the Czech courts could not find the applicant guilty of the alleged crime. This stance is also confirmed by the position of the Parliamentary Institute of the Chamber of Deputies of the Czech Republic, which carried out an analysis of the currently planned amendment to the Act on Pharmaceuticals, which introduces the "cannabis into pharmacies" programme, to see if this programme was compatible with EU law, and recommends notifying the European Commission of the draft act according to Directive 98/34/EC as a non-harmonised national provision with an impact on the free movement of goods (see Annex 10). 27) In the following text the applicant corroborates in detail the fact that the Supreme Court in particular was obliged in the given case to submit a request for a preliminary ruling. By failing to do so it violated both Article 267 (32) of the TFEU and Article 6 of the Convention. The Constitutional Court also violated the right to a fair trial under Article 6 of the Convention by finding the actions of the Supreme Court adequate from the perspective of the right to a fair trial according to Article 36 of the Charter of Fundamental Rights and Freedoms. 28) After the first instance court did not react at all in its ruling (see Annex 2) to the applicant's objection of unenforceability (see Annex 1), the applicant, in his appeal to the Regional Court, pointed out the fact that Regulations are not a priori an eligible instrument for applying the exemption from the obligation to notify laid out by Article 10 (1) of Directive 98/34/EC (see Annex 3). 29) After the Regional Court supported its ruling (see Annex 4) with this very argumentation without stating which specific provisions of which Regulation are the basis for the contentious provisions of the Act (which the applicant believes it could not have done, as no such provision exists), the applicant explicitly raised the objection in its appeal to the Supreme Court (see Annex 5, page 8) that the Regulations in question deal with a separate area (that of precursors), that the transposition of EU Regulations by national regulations is essentially not acceptable from the viewpoint of EU law and that the Regional Court did not state which specific provisions of the Regulations in question served as a basis for the adoption of the contentious legal requirements, as well as that the given Regulations did not contain provisions directly or indirectly requiring the adoption of the contentious provisions in the Act on AS. 30) The Supreme Court however assumed the same extremely general and in the applicant's opinion clearly mistaken argumentation as the Regional Court, adding only a list of the EU Regulations and other EU rules that the Act was allegedly implementing without stating, as with the Regional Court, which particular provisions of which EU rules were the basis for transposition of the contentions requirements in the Act (see Annex 6). 32) Unfortunately however the Constitutional Court also sided with the substantiation of the previous courts without taking into account the detailed objections of the applicant or addressing them in any way (see Annex 8). 33) With the blanket claim that the Act on AS makes use of the exemption under Article 10 (1) of Directive 98/34/EC because it allegedly implements Regulations, Czech courts have committed a manifestly irrational assessment mixing up the general regime for Regulations (forbidding transposition) and the general regime for Directives (requiring transposition eligible to make use of the exemption under Article 10 (1) of Directive 98/34/EC). 34) While it cannot be ruled out, as the applicant states in point 23 of this application, that in particularly exceptional cases there could be a Regulation requiring transposition within the meaning of Article 10 (1) of Directive 98/34, it must be stated that the Czech courts did not address this extreme (theoretical) possibility, which the applicant considers a grave error. 35) The applicant emphasises this point in order to show that it is not asking the Court for Human Rights (hereinafter also as the "Court") to judge an EU legal issue, which is the jurisdiction of the ECJ, but rather is pointing out, from the perspective of the Convention, the degree to which it is clear that this argument used by the Czech courts is incorrect. 36) As follows from points 16-32 of this application, from the viewpoint of Article 6 of the Convention, Czech courts violated the right to a fair trial by not including in their rulings any substantiation in response to the specific and decisive argument brought up by the applicant (judgment of the Court Benderskiy 22750/02, points 45 and 46). 37) This specific argument must be taken into account particularly in the applicant's complaint before the Supreme Court and Constitutional Court, when he asked these institutions to substantiate which specific provisions of the Regulations in question required the Czech Republic to adopt the contentious requirements of the Act on AS, as the previous instances had clearly failed to distinguish between the regime for Regulations and Directives and claimed that the Act on AS makes use of the exemption from the obligation to notify on the grounds that it transposes Regulations. 38) Any future objection of the Czech Republic that the Czech courts dealt with this argument by stating that the Act on AS implements Regulations, the senselessness of which the applicant has repeatedly pointed out as a Regulation cannot be a priori transposed, cannot be accepted – nemo auditur propriam turpitudinem allegans. 39) The decisions of the Czech courts furthermore fail to meet the requirements of the Court case-law in the joined cases 3989/07 and 38353/07 Ullens de Schooten et Rezabek v Belgium, which relate to the violation of the right to a fair trial in the specific issue of national courts not referring questions to the ECJ for a preliminary ruling. 40) Although in this judgment the Court refused to review the merit of the substantiation national courts use to refuse to request a preliminary ruling from the ECJ, it did demand that a court decision include such a due substantiation (see point 61 "la tâche de la Cour consiste à s’assurer que la décision de refus critiquée devant elle est dûment assortie de tels motifs"). 41) The aforementioned requirement to include substantiation cannot, in the applicant's opinion, be understood formalistically in the sense that national courts can absolve themselves of the obligations of Article 6 (1) of the Convention in relation to the obligations from Article 267 of the TFEU by stating just any and in fact an a priori irrational rationale without having to address the specific arguments that are decisive for resolving the dispute. 42) First of all, as follows from point 67 of the aforementioned judgment, the Court examined the scope of the individual substantiations and the overall procedure by which the Belgian Court of Cassation refused to request a preliminary ruling from the ECJ. 43) Furthermore, as stated in the second paragraph of point 66 in the aforementioned judgment, the objection that the principle of contradiction had been violated in relation to the question of the scope of the ECJ case-law on the given matter was rejected by the Court due to the fact that the deadline under Article 35 of the Convention had passed; it follows that otherwise the Court would have reviewed whether the decision of the Belgian Court of Cassation included a substantiation in relation to this objection. 44) These facts show that the Court – without substituting for the ECJ and interpreting EU law by itself – reviews the substantiations of national courts from the perspective of upholding the substantive requirements laid down by the Convention, i.e. just as in other cases with a purely national legal element it demands that national courts include rationales in their decisions addressing the specific and decisive objections of the complainant (Court judgment Benderskiy 22750/02, points 45 and 46). 45) In other words, the case-law of Ullens de Schooten et Rezabek v Belgium is nothing more than the case-law of Benderskiy applied to the specific question of requesting a preliminary ruling from the ECJ. 46) As already stated in point 37 of this application, this specific argument must be seen in the applicant's objection that the a priori insufficient claim of the previous instances, which said the Act on AS makes use of an exemption from the obligation to notify because it implements Regulations, can only stand if the courts substantiate which specific provisions of the Regulations in question causally require adoption of the contentious requirements in the Act on AS – see the aforementioned objection of the applicant before the Constitutional Court, which explicitly refers to points 36, 43 and 44 of C-289/94 Commission v Italy, where the ECJ demands that there be a direct link between the national transpositional provisions and the EU rules. 47) It must be reiterated here that the Czech courts did not address this specific argument in the least. 48) Furthermore the Czech courts were constantly reminded of the senselessness of their blanket claim that the Act on AS implements Regulations, which of course may not a priori be transposed. The courts were also alerted to the fact that the EU Regulations in question primarily deal with precursors and cannot provide a basis for the national legal treatment of narcotic substances themselves. These arguments were also not addressed whatsoever by the Czech courts. 49) The applicant believes these facts must be understood as indications attesting to the fact that the Czech courts, having evidently run out of arguments, committed intentional wilfulness. 50) The applicant understands that the Czech courts may have acted in this manner primarily on the basis of their fear of "setting a precedent" for other cases where drugs are being sold on the black market. As the applicant stated in footnote 5 of this application however, only narcotic substances for medical and scientific purposes enjoy legal protection in the EU. But even assuming that a drug dealer were to take advantage of the unenforceability of the requirements in the Act on AS, the legal error was made by the Czech Republic when the Czech executive (Ministry of Health) failed to report the Act on AS in accordance with Directive 98/34/EC. The arbitrary actions of Czech courts can find no justification in the Convention. 51) The applicant takes the liberty of remarking that if the Court of Human Rights were to "approve" the approach of Czech courts in a case so clear as the one in question, it would absolve national courts of any real obligation to provide substantiation in relation to Article 6 (1) of the Convention and Article 267 of the TFEU, as it would allow national courts to state any rationale, even an intentionally erroneous one. In other words, in such cases the protection of Article 6 (1) in relation to the intent of Article 267 of the TFEU would lose all impact (i.e. the effectiveness of protection of human rights would cease in such a case). 52) Conclusion of this section of the application: The Czech courts, and in particular the Constitutional Court and the Supreme Court, which was obliged to request a preliminary ruling from the ECJ, acted in violation of Article 6 (1) of the Convention as interpreted by the judgment of the Court for Human Rights in the joined cases 3989/07 and 38353/07 Ullens de Schooten et Rezabek v Belgium, points 60 and following. 53) The applicant also accuses the Czech Republic of violating several fundamental rights by finding his actions criminal based on an absolute prohibition of growing cannabis with a THC content of over 0.3 % (Section 24 of the Act on Addictive Substances); in proceedings before national courts the applicant subsumed these under the Czech constitutional law standards of Article 31 of the Czech Charter of Fundamental Rights and Basic Freedoms (LZPS), according to which everyone has the right to basic protection of their health, Article 15 (2) guaranteeing the freedom of scholarly research and of artistic creation, and Article 1, according to which people are free, have equal dignity and enjoy equality of rights (see Annex 8). 54) Transferred to the legal system laid down by the Convention, the applicant states that by finding his actions criminal on the basis of an absolute prohibition of growing cannabis (including growing for medical and scientific purposes) the Czech Republic violated his right to privacy under Article 8 of the Convention, freedom of expression of beliefs under Article 9 of the Convention and freedom of assembly and association according to Article 11 of the Convention. 55) In the following section the applicant shall proceed in several steps. First the applicant shall substantiate that the criminal prosecution for provision of cannabis to the sick for medical purposes is an encroachment on the right to respect for one's private life. Then he shall bring up both the EU and the international context stipulated by the United Nations (hereinafter the "UN"), and last of all he shall demonstrate the failure to uphold the conditions of Article 8 (2), in particular in terms of the inappropriateness of the Czech legal treatment stipulating absolute prohibition of cultivation of cannabis with a THC content over 0.3 %. 56) By way of introduction it should be stated that, despite the fact that in the opinion of the applicant, the State's prohibition of growing and handling cannabis, in cases of serious illness, goes against Article 2 of the Convention laying down the right to life and Article 3 of the Convention prohibiting inhuman or degrading treatment, the applicant shall abide by the positive distinction made by the Court on case 2346/02 Pretty v United Kingdom. Should however the Court find that Article 8 is subsidiary to Articles 2 and 3 of the Convention in this case, the applicant requests that the following also apply to these articles. 57) If the Court has already granted under Article 8 of the Convention the personal autonomy of a person to decide to end their own life (Pretty judgment, points 61 and 67), it means a fortiori that this provision of the Convention essentially also guarantees the free choice of each person as to what treatment (and potentially palliative) means they choose. 58) The consumption of cannabis for medical purposes and thus also the cultivation of cannabis by the sick to this end thus a priori clearly falls under the right to respect for one's private life according to Article 8 of the Convention. 59) It is important to realise that the prohibition of growing and handling cannabis not only means that the sick are prohibited from consuming and growing cannabis for their own treatment needs, but they are also unable to enter into a relationship with persons like the applicant, who have expert knowledge in terms of appropriate strains, dosage and manner of processing for treating the given illness. 60) The right to respect for private life, which according to the formulations commonly used by the Court includes the right to physical and moral integrity without groundless interference from the State, is affected in the given case because the absolute prohibition of growing and handling cannabis prevents the applicant from entering into a relationship with other persons / patients (judgment on Sentges 27677/02) and providing cannabis (the proper strains, processing and amount with regard to the specific illness) for treatment purposes. 61) It can thus be said that not only for the patients, but also for the applicant, who decided of his own conscience to overstep the bounds of what is permitted or criminal in the Czech legal system, the absolute prohibition of growing cannabis for medical purposes and the legal impossibility of providing this cannabis to patients represents an encroachment on the applicant's right to respect for one's private life (especially in the situation where, on the basis of the aforementioned prohibition, the State (intentionally) neglects its regulatory role in terms of reliably and safely providing cannabis for medical purposes to patients while also ensuring public safety and order – see below). 62) The State's prohibition of using and handling cannabis for medical purposes, as with the State's prohibition of providing cannabis to the ailing as in the case of the applicant, particularly in the absence of any effect State regulation, clashes with EU law and the UN Single Convention of 30 March 1961 on Narcotic Drugs in the sense that handling of narcotic substances is generally prohibited with the exception of cases of use for medical and research purposes. a. The ECJ bases its position on the fundamental distinction, that since the harmfulness of narcotic drugs, including those derived from hemp, such as cannabis, is generally recognised, there is a prohibition in all the Member States on marketing them (point 36 of the judgment – emphasis and footnote added). b. On the basis of this, the ECJ comes to the conclusion that " in the course of marketing narcotic drugs which are not distributed through channels strictly controlled by the competent authorities with a view to use for medical or scientific purposes, a coffee-shop proprietor may not rely on" the basic freedoms of EU law to object to a national regulation that (completely) restricts their activity (point 54 of the judgment – emphasis added). c. What follows from this a contrario is that narcotic substances such as cannabis that are used for medical purposes are marketable goods within the meaning of the fundamental freedoms of the EU internal market according to Articles 34, 35 and 56 of the TFEU. d. The ECJ then situates the aforementioned basic distinction into the international context of the UN: "That legal position complies with various international instruments [...], such as the United Nations Single Convention on Narcotic Drugs, concluded at New York on 30 March 1961 [...]. In the preamble to the Single Convention the parties declare themselves conscious of their duty to prevent and combat addiction to narcotic drugs, whilst recognising that the medical use of narcotic drugs continues to be indispensable for the relief of pain and suffering and that adequate provision must be made to ensure the availability of narcotic drugs for such purposes. Under Article 4 of that convention, the parties are to take all the measures necessary to limit exclusively to medical and scientific purposes the production, manufacture, export, import, distribution of, trade in, use and possession of drugs." (points 37 and 38 of the judgment – emphasis added). 64) On the basis of the above it can be claimed that EU law and international UN law do not lay down any prohibition of growing and handling cannabis for medical purposes. 65) On the contrary, the indispensability of cannabis use for medical purposes is clearly acknowledged by EU law and the UN Single Convention, and therefore by the parties to those two international organisations. 66) In the case of the Single Convention, it can be inferred that the handling of cannabis for medical and scientific purposes is acknowledged as indispensable by UN international law. 67) In the case of EU law it can in fact be inferred that in the case of cannabis for medical and scientific purposes, it is a marketable product recognised by EU primary law on the EU internal market, which individuals can rely upon if a State lays down unfounded cross-boundary barriers to trade. 68) In terms of the rationale for prohibiting the cultivation of cannabis for medical purposes, it is undisputed that it is a measure laid down by the law, as required under Article 8 (2) of the Convention. 69) It can also be allowed that this measure pursues the legitimate goal of preventing the cultivation and trafficking of cannabis for its narcotic effects from the perspective of public health and safety. 70) Nevertheless, the measure in question is disproportionate, as it is guided exclusively by the effort to restrict the cultivation and trafficking of cannabis for its narcotic effects, and in no way allows – even in the slightest form – for the handling of cannabis for medical and scientific purposes. 71) A more appropriate measure would be if the State would embrace its regulatory powers and (in accordance with the public interest of restricting abuse of cannabis for its narcotic effects) establish methods (procedures) for supplying medical cannabis to patients reliably and safely. Additional support for this argument is that patients would no longer be stigmatised and criminalised and forced to turn to the black market with cannabis that is inappropriate for medical use (containing chemicals from fertilisers, sick or mouldy cannabis, too much THC, inappropriate cannabinoid synergy for the given illness, etc.). 72) If the consumption of cannabis for medical and scientific purposes is categorically prohibited by the State, as is the case in the Czech Republic, this measure is a much more severe encroachment than is necessary to achieve the pursued end. 73) The disproportionality of this encroachment is all the more evident if the State goes beyond the framework of what is required to fulfil EU and international commitments and on the contrary infringes on (human) rights and international relations that are intentionally not encroached upon by these commitments. 74) In light of the fact that the Court's case-law does not emerge from a "legal vacuum", i.e. in the sense that the Court does in fact (as in the cases of assisted suicide and euthanasia) take into account the state in "surrounding" legislation, it would be a legal paradox if this court negated a right recognised by the EU legal code and the international code of the UN in terms of using (handling) narcotic substances such as cannabis for medical and scientific purposes. 75) In other words, it would be a paradox if the Court allowed a party to categorically encroach on an area where neither EU nor international UN law stipulate any categorical interference and in fact deliberately exclude the given area from a regime of prohibition with regard to its benefit for both individuals and society and for this reason explicitly recognise the indispensability of maintaining it. If however the Court were to allow such categorical encroachment (prohibition) by the State in this area, it would be the Court itself that would negate the enforceability of all human rights goals pursued by the EU and UN legal treatment in this area. 76) If the State is now, in conflict with EU and UN goals, to categorically prohibit any cultivation and handling of cannabis, then it is encroaching upon the execution of the right to respect for the private life of patients to use cannabis for medical and scientific purposes in such a disproportionate manner that it does not tolerate any room for consideration by the State. 77) In this situation the State cannot categorically penalise both consumption of cannabis for medical purposes by patients and the path by which this cannabis finds its way to the ailing – via third parties, in this case via the applicant – if it refuses to use its regulatory powers to set up safe conditions for the goods and the persons providing the goods to be reliable. It is a generally known fact that cannabis is difficult to patent, which impedes financial support for research and the interest of pharmaceutical companies and creates a vicious cycle for education and public awareness on the basis of evidence and in particular prevents the education of the professional public. 78) The applicant has repeatedly stated that the situation would naturally be different if the State used its regulatory powers to make medical cannabis available to patients reliably and safely for the public interest or otherwise made it available, including for scientific research. 79) If however the handling of cannabis for medical and scientific purposes is, as in the case of the Czech Republic, categorically prohibited by the State, this measure represents an excessive and unacceptable encroachment on the right to respect for one's private life using cannabis for medical purposes and carrying out research in this area including breeding medicinal strains of cannabis. 80) By finding the applicant guilty of unlawful handling and growing of cannabis for medical and scientific purposes, the State violated the applicant's freedom to manifest his beliefs according to Article 9 of the Convention. 81) On the basis of thousands of years of experience by humankind and scientific evidence published since the 1950s, as well as on the basis of his own empirical experiences with providing cannabis to patients for medical purposes, the applicant has sufficient proof on the effectiveness of this method of treatment, which can not only compete with conventional treatment methods for a number of illnesses, but in some cases even surpasses conventional methods or is in fact the only effective treatment, all without the devastating side effects of many official medicaments. It has been repeatedly shown that cannabis is one of the safest medicines; one cannot overdose with it and there is no fatal dosage. 82) As with the case of the applicant's arguments above on the violation of Article 8 of the Convention, which the applicant takes the liberty of applying in their full scope to violation of Article 9 as well, the absolute prohibition of handling of cannabis encroaches on the applicant's right to manifest his belief (and conscience) in providing the sick with effective treatment and, in connection with optimising this treatment, to carry out scientific research including breeding and cultivating medicinal strains of cannabis. 83) Although this prohibition is prescribed by law and follows a legitimate goal or goals listed under Article 9 (2) of the Convention, this encroachment is not necessary (proportionate) in democratic society, particularly with regard to its categoricality and the fact that it clashes with EU and UN law – see above. 84) It was corroborated to the courts by non-governmental organisations duly registered in the Czech Republic (Act on Associations of Citizens, Act No. 83/1990 Coll.) fulfilling their missions and working on the research for "Konopí je lék" with evidence (see Annex 3, 5 and 7) that State authorities repeatedly denied the applicant his rights protected by the Convention under Article 11. 85) The courts were provided with evidence that the applicant and members of non-governmental organisations could not protect the interests of their members and fulfil the mission (recognised by the State) of the public benefit organisation. 86) Non-governmental organisations, via the applicant, submitted the requested evidence on the use of medicinal cannabis to the Regional Court (see Annex 3, addendum – evidence) and it was demonstrated that the non-governmental organisations working on the research that the applicant was leading and which the family of the applicant had long supported received a gift from Prague City Hall and a grant from the Olga Havel Foundation's Committee of Good Will for research into treatment of cancer and asthma (see Annex 5, page 4). 87) State authorities were repeatedly criticised for the criminalisation of the activities of the non-governmental organisations, including for violation of the provisions of the Public Health Care Act and the role of the public benefit organisations stated in this act (see Annex 3, addendum, page 1 and Annex 5, page 6). 88) The applicant's years of requests for the cooperation of the police and the protection of the research and non-governmental organisations by the police (see Annex 5, page 3) did not lead the State authorities to protect the rights protected by the law and Convention under Article 11. 89) When the applicant and non-governmental organisations involved in the research brought charges of abuse of power by officials, damaging of foreign rights, etc., the public prosecutor's office rejected them as groundless, even though the police presidency asked to have them investigated (see Annex 5, page 3). 90) These actions illustrate the violation of Article 11 of the Convention by the Czech Republic. b. find that the Czech Republic violated Articles 6, 8, 9 and 11 of the Convention toward the applicant. Diabetes and dual diagnoses associated with serious illnesses; cannabis treatment has a causal effect on some forms of cancer; successful treatment has also been recorded for Parkinson's, Crohn's and Alzheimer's diseases, multiple sclerosis, depression and alcoholism, epilepsy, burns, intense pain, migraines, nausea, high blood pressure, skin diseases, asthma, arthritis of the joints, inflammatory diseases, etc. "Diabetic foot" set to be amputated (sepsis), malignant forms of skin cancer, glaucoma, phantom pain, chronic conditions and aging-associated diseases, "butterfly disease", etc. Directive 98/34/EC of the European Parliament and of the Council of 22 June 1998 laying down a procedure for the provision of information in the field of technical standards and regulations and of rules on Information Society services. The following was submitted by the applicant and was not called into question by the Czech courts. a. Cannabis for medical use is, from the perspective of EU law (and UN Conventions), a marketable product and falls within the scope of EU law (judgment on C-137/09 Josemans, point 36). A contrario, cannabis and other narcotic substances used for non-medical uses are not a marketable product and do not enjoy the protection of EU law. This allows Czech courts to avoid the situation that drug traffickers would successfully copy the applicant's argumentation before the courts. c. The contentious provisions of the Act on AS are technical regulations within the meaning of Directive 98/34/EC, as they influence the marketing of the given product, yet do not result from binding EC/EU regulations, i.e. in particular from Directives, and therefore in order to avoid barriers to movement are subject to the notification obligation as per Directive 98/34. In light of the accessibility of ECJ judgments at www.curia.eu, the applicant shall not include more extensive references to the case-law of this court. A description of the issue of Directive 98/34 can be found at the European Commission's site www.ec.europa.eu/enterprise/tris, where it can also be verified that many Member States report national legislation on addictive substances, which in the case of the Czech Republic only took place on 21 May 2012 through notification 2012/329/CZ, by which the Czech Republic implicitly affirms the applicant's position that the Act on Addictive Substances was to be reported in accordance with Directive 98/43. Without exaggeration the applicant takes the liberty of asserting here that any law student would be thrown out of an exam on EU law if they mixed up the regimes for Regulations and Directives. The applicant includes this fact in order to show that he is not asking the Court for Human Rights to judge an EU legal issue, which is the jurisdiction of the ECJ, but rather is pointing out the level of faultiness in the argument of the Czech courts from the perspective of the Convention. The clarity of the case must be seen in the fact that, in contrast to, for example, legal disputes relating to violation of Article 34 of the TFEU on the free movement of goods where the result of the dispute is unsure due to the fact that a state restriction on import could be substantiated by the public interest and could be commensurate, the legal result of the failure of the State to uphold the obligation to notify according to Directive 98/34/EC is clear and automatic and always results in the unenforceability of the regulation based on the case history of the ECJ. For understanding it is important to add that the sale of cannabis in the Netherlands by coffee shops for its narcotic effects is not legalised, but merely tolerated. See the Court's position on the case 2346/02 Pretty v United Kingdom, point 40, under which the Court refers to the position of States in Recommendation 1418 (1999) of the Parliamentary Assembly of the Council of Europe; likewise on the same issue there is a reference in point 66 to a decision by the Supreme Court of Canada on the case Rodriguex v the Attorney General of Canada. See footnotes 1 and 2.